Nonsteroidal Antiasthma Agents are yet another class of medications that you must be familiar with as a Respiratory Therapist. This is exactly why we built this study guide for you that is loaded with tons of helpful practice questions on this subject. There’s no need to waste anymore time. Are you ready to get started? 1. What is the general indication for the clinical use of nonsteroidal antiasthma agents? They are used for the prophylactic management of mild persistent asthma. 2. Are nonsteroidal antiasthma drugs considered controllers or relievers? 3. A patient who is experiencing an acute exacerbation of asthma will find relief from what type of medication? A bronchodilator (for example, albuterol). 4. What are mast cells? They are connective tissue cells that contain heparin and histamine. 5. What are three anti-leukotriene agents? 6. Is cromolyn sodium available as an MDI? 7. What is the brand name for Zafirlukast? 8. What is extrinsic asthma associated with? 9. What is the product of an immune response? Allergic inflammation of the airway. 10. What plays a central role in attracting mast cells and eosinophils? T lymphocyte which releases mediators that attract other cells and damage epithelial cells. 11. What are the medical conditions when there is an elevated FENO? Asthma, chronic bronchitis, chronic cough, sarcoidosis, pneumonia, alveolitis, bronchiolitis obliterans syndrome (BOS), and bronchiectasis. 12. Who can we expect a decreased FENO? 13. What is cromolyn sodium considered to be? 14. Where is cromolyn sodium effective in preventing and how? Bronchospasm by inhibiting mast cell degranulation. 15. What is the most commonly reported side effect of cromolyn sodium? 16. What are anti-sickle cell effects? Reduction in sickling possibly due to blocking of calcium-activated potassium channels that cause erythrocyte dehydration. 17. How long does the clinical application of Cromolyn Sodium take to improve a patient’s symptoms? It may take 2-4 weeks for improvement in patient’s symptoms. 18. What is the usual dose of nebulized cromolyn sodium? 20 mg four times per day. 19. What do Leukotrienes exhibit? Increased mucus secretion, inhibition of normal ciliary action, increased airway edema, bronchoconstriction, and recruitment of other inflammatory cells into airways. 20. How is Zileuton administered? 21. What are the hazards and side effects of Ziletuton? Interacts with theophylline and warfarin. 22. What are Zafirlukast’s mechanisms of action? Zafirlukast is a leukotriene receptor antagonist. 23. What is another name for Montelukast? 24. What are Montelukast’s (Singulair) mechanisms of action? Singulair is a leukotriene receptor antagonist. 25. What patients can Singulair be administered to? Adults and adolescents >15 years; pediatric patients 6 to 14 years; pediatric patients 2 to 5 years; pediatric patients 12 to 23 month; and, pediatric patients 6 to 23 months. 26. What is the dosage of Singulair for adults and adolescents >15 years? One 10mg tablet daily that is taken daily. 27. What is the dosage of Singulair for pediatric patients 6 to 14 years? One 5mg chewable tablet daily that is taken daily. 28. What is the dosage of Singulair for pediatric patients 2 to 5 years? One 4mg chewable tablet daily or one 4-mg packet of oral granules daily. 29. What is the dosage of Singulair for pediatric patients 12 to 23 months? One 4mg packet of oral granules taken every evening. 30. What is the dosage of Singulair for pediatric patients 6 to 23 months? One 4mg packet of oral granules taken daily for allergic rhinitis. 31. What is the clinical indication for the use of anti-leukotriene drug therapy, such as montelukast, in asthma? As an alternative to inhaled steroids. 32. What percentage of patients do Antileukotriene agents effective? 33. What are the advantages of Antileukotriene agents? Effective in aspirin sensitivity and often in exercise-induced asthma. 34. What is another name for Omalizumab? 35. What is the administration of Xolair? Xolair is a nonsteroidal antiasthma agent formulated as a subcutaneous injection. 36. What is Omalizumab used to treat? Omalizumab is a monoclonal antibody used to treat moderate to severe asthma. 37. Antileukotrienes can be tried as an alternative to what? Inhaled corticosteroids or cromolyn-like agents in mild persistent asthma requiring more than “as-needed” β2 agonists. 38. What is another name for Zileuton? 39. What is another name for Cromolyn Sodium? 40. What is another name for Nedocromil? 41. What is another name for Zafirlukast? 42. What medication is recommended to an adult patient with severe asthma who is also receiving corticosteroid therapy? 43. After reviewing the prescriptions for a patient who is prescribed sustained-release theophylline (Theo-dur) for asthma control, the respiratory therapist understands that the dose of theophylline should be adjusted. What medication does the respiratory therapist find in the patient’s prescriptions? 44. What medication in the patient’s prescription needs to be discontinued if the laboratory reports of a patient with asthma indicate that the liver enzymes are elevated three times the normal range? 45. What medications help to prevent bronchoconstriction, vascular permeability, and mucus secretions? Zileuton (Zyflo), Zafirlukast (Accolate), and Montelukast (Singulair). 46. What medication is most likely recommended for a 4-month-old infant with asthma? 47. The respiratory therapist finds that a patient with allergic rhinitis who is prescribed montelukast (Singulair) is also taking rifampin (Rifadin) for the treatment of tubercular infection. What intervention is beneficial for the patient in this situation? Closely monitor the clinical condition of the patient. 48. What is the mode of action of Zileuton (Zyflo)? It inhibits the enzyme 5-lipoxygenase (5-LO). 49. What medication has a mean half-life of 26 days? 50. What medication’s usage requires dose modification in a patient who is being treated with oral zileuton (Zyflo) for the management of asthma? Cromolyn sodium, Leukotriene modifiers, Monoclonal antibodies, and inhaled corticosteroids. 51. What treatment modification is required in an asthmatic patient using Montelukast and phenobarbital? Maintain the same dosage of Montelukast. 52. What clinical signs in an asthmatic patient on Zileuton therapy compel discontinuation of Zileuton treatment? 53. A patient is taking zileuton (Zyflo) for the treatment of bronchitis. What medication may cause complications in the patient due to concomitant administration? 54. Coadministration of what anti-leukotriene agent along with aspirin may result in complications? 55. What medication is the drug of choice for the treatment of aspirin-induced asthma? 56. What effects in a patient on theophylline therapy causes modification of the treatment plan and prescribes cromolyn sodium as an alternative to theophylline? 57. What is an alternative treatment plan for an infant with mild persistent asthma on corticosteroid therapy? Stop corticosteroid therapy and use cromolyn sodium. 58. What is the usual dose of cromolyn sodium recommended for the management of asthma? 59. What medication’s usage requires dose modification in a patient who is being treated with oral zileuton (Zyflo) for the management of asthma? 60. What modification in a treatment plan is required in a patient with asthma who is receiving treatment with cromolyn sodium who regular skier in the winter? Add beta-agonists to the treatment plan. 61. What is the category of asthma if a patient experiences an asthma attack as a result of exposure to cats? 62. What is the result of an airway obstruction that occurs with asthma? 63. What happens when the release of cytokines during an allergic response? Endothelial adhesion molecules are upregulated. 64. What are mast cell stabilizers? Cromolyn sodium, montelukast, and zatirlukast. 65. What does Cromolyn sodium prevent? 66. What is the mechanism of action for Accolate? 67. What disease can Cromolyn be used for treatment? 68. What percent solution does the ampoule or vial of cromolyn sodium contain 20 mg or mL of aqueous solution? 69. What suggestion should be given if it is determined that extubation is not possible due to glottis swelling that can be given immediately to aid in the extubation process? 70. What age can Omalizumab (Xolair) be given to children? 71. How many weeks does it take for Cromolyn Sodium to take effect? For cromolyn sodium, it may take one to three weeks for improvement in patient’s symptoms, allowing a decrease in concomitant therapy, such as a bronchodilator or steroid use. 72. What anti-leukotriene modifier is approved for children younger than 5 years of age? 73. What should be monitored once per month when taking Zyflo? 74. What drugs interact with Zyflo and may require a dosing adjustment? 75. What combination is used for treatment of chronic asthma that results in greater lung function than when these drugs are taken separately? A combination of B2 agonist and anti-leuktriene. 76. Concerning exercise-induced asthma, what promotes the generation of leukotrienes that result in bronchoconstriction? Sirflow increases irritating goblet cells. 77. Antileukotrienes are particularly useful in controlling asthma resulting from certain triggers, including what? Exercise induced asthma and aspirin induced asthma. 78. What food can be recommended for montelukast granules be mixed with when given to a child? 79. What is Cromolyn referred to as because it prevents the extrusion of granules containing mediators of inflammation to the cell exterior? 80. What is a potent vasodilator that can damage cells and contribute to epithelial damage in asthma? 81. What are the clinical indications of non-steroidal anti-asthma agents? Prophylactic management (control) of mild persistent asthma as alternatives to or in combination with inhaled steroids. 82. What are the categories of nonsteroidal antiasthma agents? Mast cell stabilizers Leukotriene inhibitors, IgE inhibitor and Antihistamines. 83. What are mast cell stabilizers? Inhibits mast cell degranulation thereby preventing release of histamine and side effects are minimal. 84. What are the two types of Mast cell stabilizers? Cromolyn Sodium (Intal) and Nedocromil Sodium (Tilade). 85. What is the Cromolyn Sodium (Intal) dose? 86. What is the Nedocromil Sodium (Tilade) dose? MDI: 1.75mg/puff and 2 puffs QID. 87. What are IgE inhibitors? White powder that must be dissolved in solution and given IM monthly. Example: Xolair. An IgG formula that attaches to and blocks IgE. It is a white powder that must be dissolved in solution and given IM monthly. 89. What are the side effects of Xolair? Anaphylaxis, viral infection, URTI and pharyngitis. 90. What are examples of Antihistamines? Diphenhydramine (Benedryl), Bromphenarimine maleate (Dimetapp), Loratadine (Claritin), Fexofenadine (Allegra) and Cetirizine (Zyrtec). 91. What is the Mode of action for antihistamines? Blocks H1 receptor sites therefore blocking the action of histamine. 92. What are the side effects of antihistamines? 93. What is associated with an allergic reaction? 94. What is an example of a mast cell stabilizer? 95. How is Cromolyn sodium effective in preventing bronchospasm? By inhibiting mast cell degranulation. 96. What is the most commonly reported side effect of cromolyn sodium? 97. What effect is a reduction in sickling possibly due to the blocking of calcium-activated potassium channels that cause erythrocyte dehydration? 98. How long will the clinical application of cromolyn sodium take? 99. What is the usual dose of nebulized cromolyn sodium? 100. What are Antileukotriene agents effective in? About 50% to 70% of patients. 101. What can be tried as an alternative to inhaled corticosteroids or cromolyn-like agents in mild persistent asthma requiring more than as-needed β2 agonists? 102. What is the clinical indication for the use of anti-leukotriene drug therapy, such as montelukast, in asthma? An alternative to inhaled steroids. 103. What is a monoclonal antibody used to treat moderate to severe asthma? 104. What is a leukotriene receptor antagonist? 105. What is administered by tablet? 106. What is a leukotriene receptor antagonist? 107. What is a nonsteroidal antiasthma agent formulated as a subcutaneous injection? 108. With what does Zileuton interact? 109. Cromolyn sodium is not available as what? 110. What are nonsteroidal antiasthma drugs considered to be? They are considered to be controllers, not relievers. 111. Where will a patient who is experiencing an acute exacerbation of asthma find relief from? 112. What is the general indication for clinical use of nonsteroidal antiasthma agents? Prophylactic management of mild persistent asthma. So there you have it. 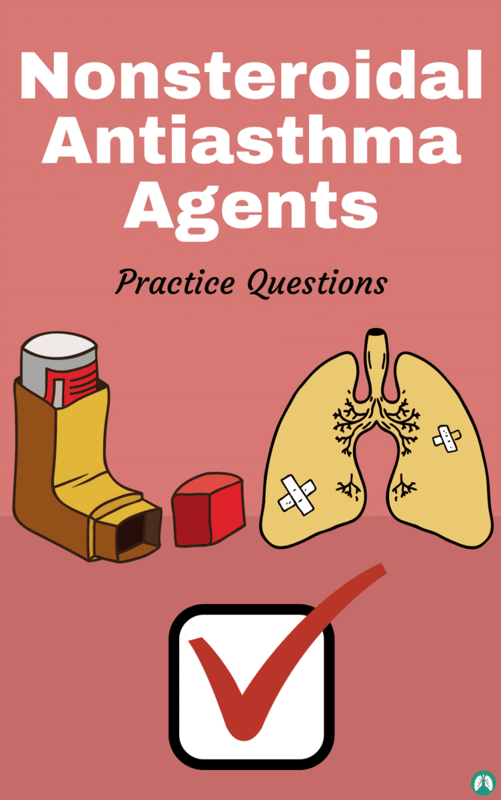 That wraps up our study guide on Nonsteroidal Antiasthma Agents and I hope that these practice questions were able to help you develop a good understand of this drug class. The good thing is, if you don’t feel confident with your knowledge of this subject, you can always go back through these practice questions until the information stick. Thank you so much for reading and as always, breathe easy my friend.